SVG is an XML based, 2 dimensional open-standard that’s been around since 1999. Since SVG graphics are vector based, they can be zoomed or scaled to any resolution without quality loss. What can you do with it? SVG has a lot of functionality: paths, basic shapes, vertical text, text on a curve, gradient fills, masks, etc. Another tool for adding visuals to the web is the recently added HTML5 Canvas element. SVG and Canvas are not the same thing. Whereas SVG is vector based, Canvas uses raster graphics. SVG elements remain live and addressable in a scene graph (the DOM) after they’ve been rendered to the screen, so you can update them after rendering. Canvas uses a procedural approach – rather than declaring elements with XML, commands are only executed via scripts. In canvas, once an object has been drawn to the screen, it’s forgotten. If you need to move that object, you need to re-render the entire scene. So to get started – we need to learn some more basics of SVG. The axis starts in the top left corner of a root SVG element and counts up as you move down and towards the right. If you have a 500×500 region, the point [0,0] is in the upper left, and [500,500] is in the bottom right. 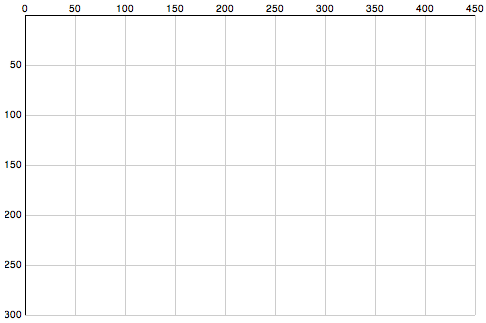 Here’s a chart to illustrate SVG’s coordinate space, followed by the code to draw the chart. .attr("height", 320) // moar space! That’s a bit long, eh? Here is the whole example. D3 actually has more convenient functions for drawing axis lines, I’ll leave those for another time. That’s all for tonight!